Journalists are comparing Ad Blockers to a virus and predicting large losses and more sleepless nights for Publishers in 2016! 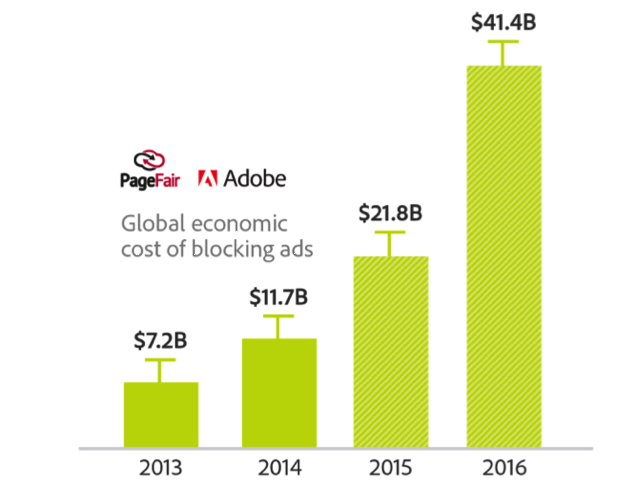 According to a new study by Adobe and PageFair, the amount of global revenue lost to online ad-blockers increased 41 per cent over the past year. Undoubtedly, this trend will continue accelerating, especially since the release of Apple’s iOS 9, which makes it as easy as pie to block ads on mobile devices. Should Publishers be concerned about Ad Blocking? Facebook warned investors in January that ad blockers could "adversely affect" future profits. Could flexible Pay Walls help bridge the gap with diminishing ad revenues? “If readers don’t want to pay for content with their eyeballs, they can pay with their credit cards”. Nicole Cliffe, Editor of Toast magazine has introduced a donation system where if their users decide to use and ad blocker, they need to make a donation of $5 per month. Condé Nast tech title is taking a hard-line against the readers who want content that is free from both subscription fees and pesky advertisements. Dan Yoder at Panda Strike believes that the problem is the content producers and how they diminish the value of their content by writing click-bait articles and then shoving ads in your face for page views. Then they complain because users don’t want to pay for content. He suggests taking a leap of faith when asking users to pay for content. Prove to them you value your users, known and anonymous; don’t just pander to drive-by readers. Publishers are beginning to realize that ‘traditional’ digital content monetization approaches are under pressure due to various economic, social and technological factors. Therefore, the key to successfully monetize their content is to experiment with different models and constantly evolve. Flexible meters with real time segmentation will be paving the future of publishing content strategy. Publishers could detect ad blocks present for particular users and if found, present a dynamic wall as a mechanism to restore lost revenues from ads. The wall could present a request to disable the ad blocker or subscribe to access content. Implement flexible pay walls including hard, freemium, premium and hybrid models. Single/social sign on to increase security and improve user experience. Contact Evolok for further information.